Skin Deep | Have you heard about the latest advancements in skin care? Have you heard about the latest advancements in skin care? 11 Jan Have you heard about the latest advancements in skin care? Advanced Nutrition Programme is a premium range of skin specific supplements, made with the purest ingredients, in just the right ratio to effectively maintain skin health and target skin concerns. Advanced Nutrition Programme supplements are essential to your skincare routine. When skin is making healthy cells on the inside, it will appear clear and radiant on the outside. 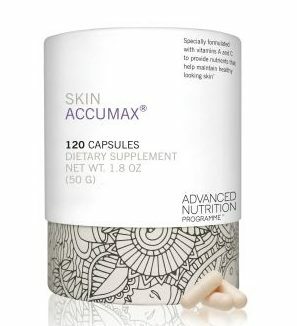 Advanced Nutritional Programme just received a patent for Skin Accumax? Benefits: Helps Balance sebum production-Supports skin immunity-Reduces hyper-keratinization -Anti-inflammatory-maintains healthy looking skin.